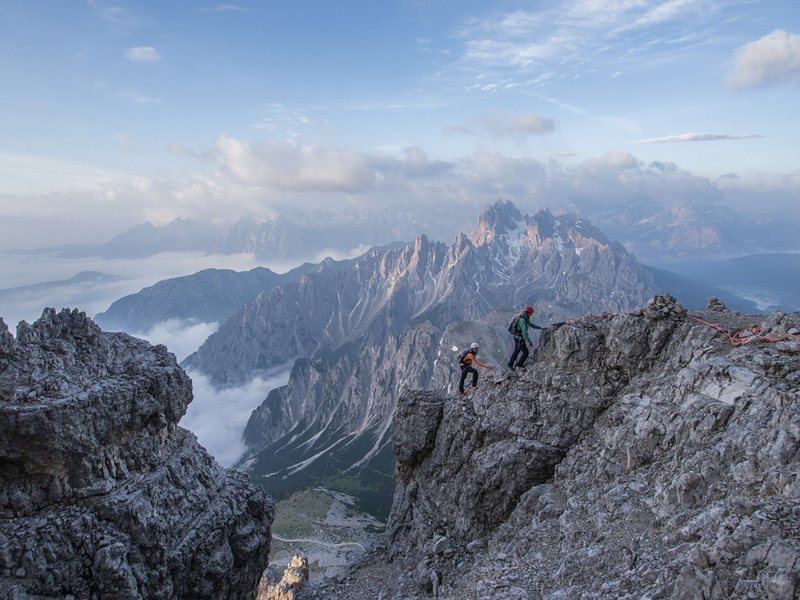 Cima Grande: A long term dream! Our base for climbing Cima Grande is the perfectly located Chalet / Rifugio Lago Antorno, the closest accomodation to the Tre Cime apart from Auronzo and Tre Cime hut. As the weatherforecast is not as good as it could be and predicts rai for 11 MA, we get up at 3 AM. It`s still completely dark and after a 15 minutes drive into the Three Peaks park, we park our car at the emoty car park close to Auronzo hut. We start walking a slow and steady pace, the temperatures are comfortable and with every altitude meter we gain, the sky gets a little lighter. After roughly 30 minutes of hiking approach, we reach the point where Michi decides to rope up. Although the rating of the first pitches is only 1 to 2, we are from now on a roped party and Michi wouldn`t let us alone. The climb is never really exhausting and Michi doesn`t rush. Every time he`s leading the next pitch and preparing the belay, we have time to take pictures and enjoy the stunning views. The most difficult pitches are the later ones, including an almost 20 meters chimney in which you have to stem against slippery walls. The moisture of the mist and rain of the night doesn`t help with that and we have one short moment of shock when Maggy unexpectedly looses grip – this is the first time we really realize what the rope is for! Thankfully nothing bigger happens and apart from a cut finger, we`re able to proceed to the summit. On top of Cima Grande! We take a short break on the top, but after a few pictures we quickly start our descend back down. Clouds are coming in and we absolutely want to avoid climbing on wet rocks. Michi would eventually rappel us down in the places with fixed pros, which is fun too. 😉 At exactly 11 AM and a another short breakfast break later, we arrive back at our car – and with us does the rain. A few years, if not even months ago, we didn`t think that we would ever see the Three Peaks from this point. Thank you so much Adidas TERREX for giving us a reaseon to intensify our climbing skills, to chase a target and to make another dream come true. TERREX Mountain Project, we`re ready!